Name take from the country of Mexico. Before Land of Enchantment became the state slogan, New Mexico went by the nickname The Sunshine State, based on the fact that every part of New Mexico receives at least 70 percent sunshine year-round. 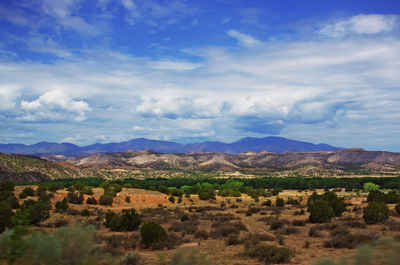 New Mexico received its nickname because of its natural beauty and rich history. The Spanish and Mexicans used to occupy the state and there is still a lot of their culture leftover. For example, New Mexicans have many Spanish fiestas, Spanish food and Spanish is spoken everywhere. Every year thousands of tourists visit this enchanted state and you can be one to! Come visit New Mexico! It really is a land of enchantment. "New Andalusia" is a reference to a part of southern Spain where culture and beauty mix well. "Land of the Cactus" refers to the cacti that grow so abundantly in the state, particularly along the border with Mexico and on the plains. "The Colorful State" is a nickname shared with Colorado and a reference to the many different and colorful scenic areas to be found here. The Land of Sunshine or The Sunshine State are nicknames that refer to the generous portion of sunshine that "rains" down upon New Mexico. "Sunshine State" appeared on state license plates before 1941. This nickname, suggested by George Wharton James, was to celebrate the state's influence on literature and art and because "...it is also the home of the first real field-school of American Archaeology in America." The name was suggested by a book by Adolf Bandelier,The Delight Makers. "The Outer Space State" is a reference to reported incidents that occurred in Roswell, New Mexico, including the suspected crash and cover-up of a UFO.